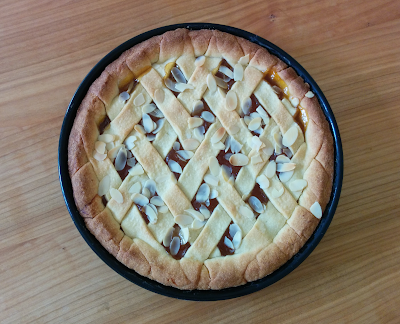 So I'm back with a quick and easy recipe to start with: a crostata alla marmellata di albicocche, which is a typical Italian dry pie or tart with apricot jam. It's great for breakfast, as snack, and with coffee and tea in the afternoon. Plus you can keep it for a few days, it won't go bad or dry, as it is already dry! In a bowl whisk egg, sugar and lemon zest together. In another one mix flour and salt, add butter, and mix by hand making making sure it is well mixed and crumbly. Make a hole in the middle and add the egg mix, mix fast into a dough. Flatten the dough a bit into a disk, cover it with plastic wrap and refrigerate for 2 hours. Butter and flour a tart pan. Roll out 3/4 of the dough into a disk, transfer it to the tart pan, and prick the bottom of the dough with a fork. Cover the dough with apricot jam. 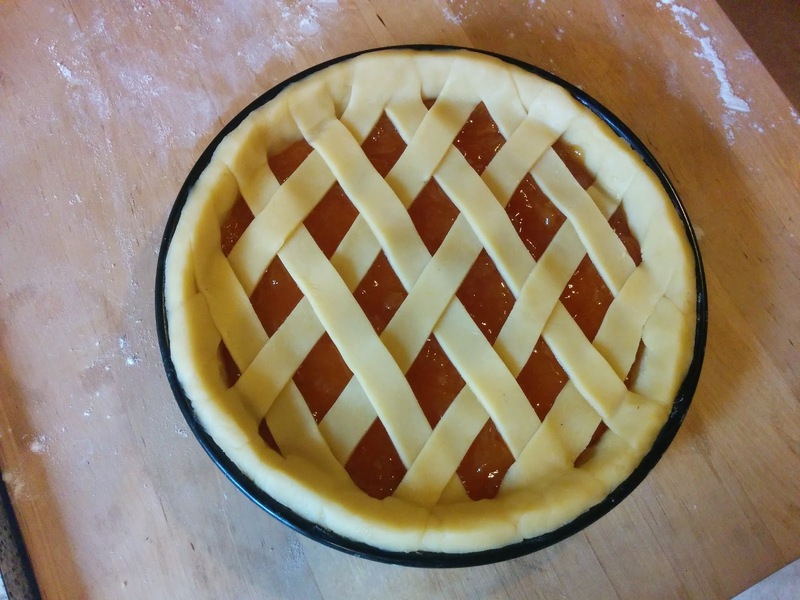 Fold out the remaining 1/4 dough, cut 1 cm-wide bands, and cover the tart with the dough bands making a criss-cross. Bake the tart 20-25 min at 200 C.